Expanding on previous energy savings strategies made by County, a work group was started in 2008 to systematically study energy use at County facilities and find ways to reduce energy. The initial study found that Kent County was ahead of the curve in tuning existing equipment and developing processes to reduce energy costs. In 2009, a second workgroup was established to strengthen the advances in energy savings, and the County Board of Commissioners enacted an Energy Use Reduction Policy. To assist in implementing this policy, the County Administrator appointed a work team comprised of members from the Kent County Sheriff's Department, Facilities Management, Human Resources, Fiscal Services, County Clerk/Register of Deeds, and County Administration. While Energy Use Reduction Policy called for the reinvestment of savings in additional energy reduction technology and programs, the team quickly realized that there was a finite level of energy reduction attainable with the County’s existing infrastructure, and significant capital investments were needed to gain future savings. The results of the work team’s preliminary survey coincided with the announcement of funding from the US Department of Energy to help local governments fund energy reduction and the work team’s focus shifted to pursuing and overseeing grant funds available for this purpose. The Department of Energy through the American Recovery and Reinvestment Act provided grant funds specifically and solely for reducing energy use by local governments. Kent County was allocated $2.8 million to develop and implement a plan to use the funds to reduce energy consumption. Investments were made at eight County buildings: Information Technology, Kent County Courthouse, 82 Ionia, Health Department, New Correctional Facility, Kent County Sheriff’s Department, MSU Extension, and the County Administration Building. The grants were used to purchase and install energy efficient lighting, motion controls, digital controls, energy efficient windows and skylights, efficient air handling units, geothermal heating, and a light reflecting white roof. The last of the EECBG projects was completed in 2012, and the results of energy use tracking for that year show that the investment has paid off and that payback estimates are on track or being exceeded. Compared with 2008 the County spent 9 percent less on energy in 2012 – 153,824 mBTU vs. 138,646 mBTU – thanks in part to the capital investments funded by the EECBG program. This calculation also takes into consideration the demand for heating and cooling as measured in degree days, which was 2 percent lower in 2012 than 2008. When looking at each building the savings are more impressive. Information Technology reduced energy by 77 percent. 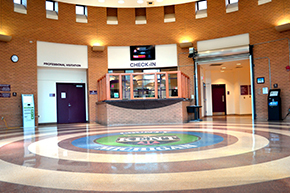 The Kent County Courthouse and the Health Department both reduced energy by 45 percent. The MSU Extension reduced energy by 37 percent. The Sheriff’s Department reduced energy by 20 percent - this amount is not insignificant when one considers that the Sheriff’s Department alone contributed to 40 percent of the County’s overall energy reduction due to the size of its facilities and the 24/7 nature of its operations. The County/City Complex reduced energy by 7 percent, and the County seeks to further collaborate with the City of Grand Rapids to further improve our energy savings. The County has continued to improve services for its residents, and in so doing additional buildings were added to the County’s inventory. In 2009 the County replaced an antiquated animal shelter with a newly constructed building with updated energy conservation technology. 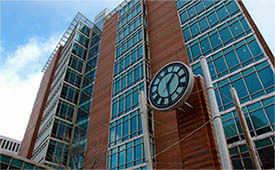 Also in 2009, the County added the Human Services Complex and completed the 63rd District Courthouse. The new Courthouse incorporates geothermal technology and was built to LEED standards. The County has also started to monitor energy use at the Juvenile Detention Center and the Community Re-entry Center after remodeling occurred at these facilities. Because of our commitment to continually improve, the County established a new base year – 2010 – to reflect the new buildings and to raise the bar. It is possible that though continued monitoring new opportunities will present themselves to continue advancing the County’s energy savings. Kent County is committed to tracking energy use and has energy consumption information available online. This data and information will be updated when information becomes available.